JM is 47 y/o athletic patient who had a 1.5 year history of severe shoulder pain and restriction in movement. He was unable to shave or lift objects from the kitchen cabinet with the affected arm. MRI was significant for advanced osteoarthritis, degeneration of the labrum and tears in the rotator cuff. Total joint replacement was the only option presented. This is a major surgery with extensive rehabilitation and relatively poor outcomes. Patient elected to undergo a non- surgical stem cell therapy: the Regenexx procedure. The patient’s own stem cells (autologous) were injected into joint, labrum and rotator cuff tears. Mesenchymal stem cells have significant repair and regeneration properties. JS made significant improvement after multiple sessions. 13 months after starting the Regenexx procedure, an MRI was obtained for comparison. The most striking changes are below. The top picture show multiple tears in the supraspinatus tendon identified by the red arrows. The extensive light-colored areas in the tendon represent swelling and tears. The bottom picture is significant. 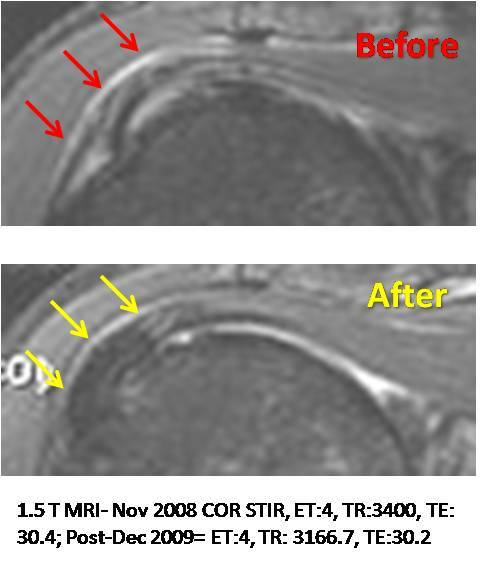 It shows significant reduction in rotator cuff tendon swelling as evidenced by the much improved dark-colored signal in the tendon which is identified by the yellow arrows. The corresponds with JS’s clinical improvement. JS was able to avoid a major surgery through the use of his own stem cells. Pain after shoulder surgery is typically related to the operative procedure, positioning and immobilization following surgery. For some patients the “shoulder” pain unfortunately never improves despite surgery. There are several reasons for this but the major one is that the shoulder was not the cause of the pain. All to often a patient complains of shoulder pain, obtains an MRI of the shoulder which shows an abnormality and then undergoes surgery with little if any reduction in the shoulder pain. At the Centeno-Schultz Clinic we are committed to identifying the source of a patients pain. This begins with a thorough physical examination and history. Radiographic studies are ordered when appropriate. One of the most common causes of shoulder pain is injury to a joint in the cervical spine or the cervical disc. How does this occur? It is called referred pain and the example most people are familiar with is a patient who goes to the ER with arm or jaw pain. They don’t need to see a dentist or an orthopedist, they need a cardiologist since they are having a heart attack. Referred pain is pain that is perceived at a site adjacent to or at a distance from the site of an injury’s origin. The cervical facet is a cartilaginous joint that can be a major source of pain. The most commomly injured facet joints are the C5/6 and C6/7 which Lord et. al., clearly demonstrated refer to the shoulder and shoulder blade. At the Centeno-Schultz Clinic this diagnosis is established if there is significant pain relief following the injection of local anesthetic and physicologic doses of steroid into the joint. Therapy for cervical facets include stem cell therapy with regeneration of the damaged cartilage. Regenexx enables a patient to use their own stem cell to regenerate damaged tendons, ligament and cartilage. The key is to make sure the the source of one’s pain is clearly identified and that all possible sources are considered. This is the commitement we stand by at the Centeno-Schultz Clinic.